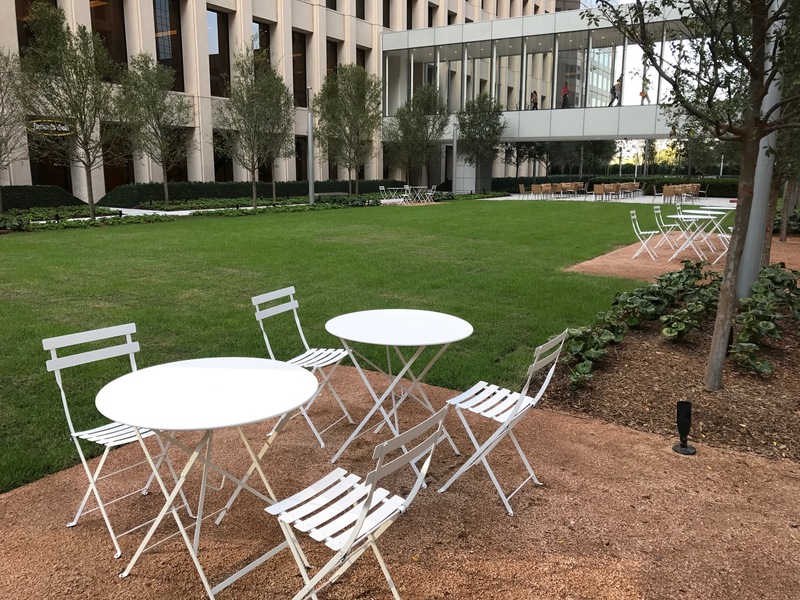 HOUSTON – (Realty News Report) – Brookfield Property Partners L.P. has announced the completion of the first phase of the redevelopment of Allen Center, a 3.2 million SF complex at the southwest corner of Smith and Dallas streets in downtown Houston. A skybridge was removed, the lobby of One Allen Center was revamped and a one-acre park was created. The $48.5 million redevelopment is part of the trend for office buildings built in the 1970s and 1980s – which is a sizable portion of the downtown office market. Building owners like Brookfield are faced with a choice – spend heavily to redevelop the buildings to meet the modern space demands of the Millennial generation – or let the buildings decline into Class B status. The first office tower in Allen Center was started almost 50 years ago. The two other main towers were added shortly thereafter. Overall, a veteran of the Hines organization, was recently brought on to oversee Brookfield’s Texas operations during a period of the company’s expansion here. Long-time Brookfield executive Paul Frazier, left the firm earlier this year. The key to the redevelopment was the removal of the skybridge between the One Allen and Two Allen buildings. The skybridge and an earthen berm blocked out Smith Street and the sidewalk from Allen Center. It was all part of the urban fortress planning from decades ago when tunnels and skybridges ruled. “In designing The ACRE, we wanted to create a space tailored to meet Brookfield’s dedication to place making,” said landscape architect Chip Trageser, managing principal with the Office of James Burnett. The Office of James Burnett, a firm founded in Houston in 1989, is no stranger to urban parks. The firm designed the award-winning Klyde Warren Park, a catalytic over-the-freeway park in downtown Dallas. In a tour of the property last week, Trageser said the Office of James Burnett was interested in designing the proposed over-the-freeway park near the east side of the George R. Brown Convention Center in downtown Houston. The seven-acre Allen Center complex also received improvement to its One Allen Center building, a 1 million SF, 34-story tower at 500 Dallas Street. One Allen Center, which opened in 1972, now has a two-story, clear glass façade with art by Tokujin Yoshioka and a slot for a chef-driven restaurant.